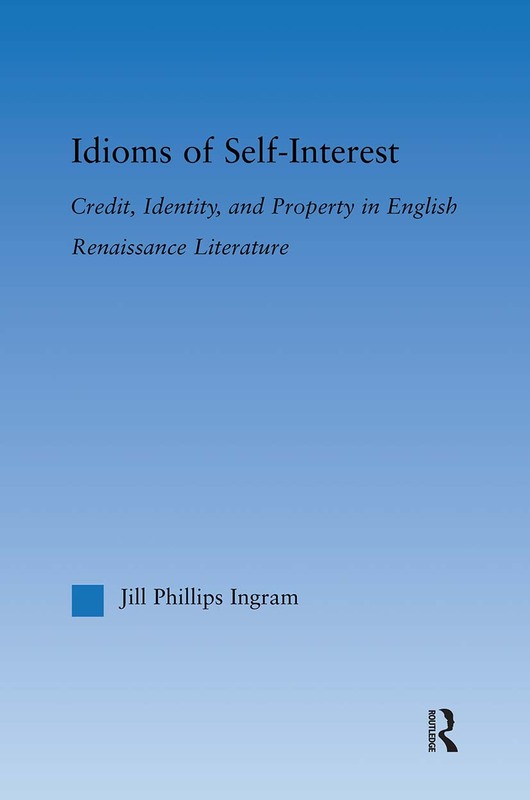 Idioms of Self-Interest uncovers an emerging social integration of economic self-interest in early modern England by examining literary representations of credit relationships in which individuals are both held to standards of communal trust and rewarded for risk-taking enterprise. Drawing on women’s wills, merchants’ tracts, property law, mock testaments, mercantilist pamphlets and theatrical account books, and utilizing the latest work in economic theory and history, the book examines the history of economic thought as the history of discourse. In chapters that focus on The Merchant of Venice, Eastward Ho!, and Whitney’s Wyll and Testament, it finds linguistic and generic stress placed on an ethics of credit that allows for self-interest. Authors also register this stress as the failure of economic systems that deny self-interest, as in the overwrought paternalistic systems depicted in Shakespeare’s Timon of Athens and Francis Bacon’s New Atlantis. The book demonstrates that Renaissance interpretive formations concerning economic behaviour were more flexible and innovative than appears at first glance, and it argues that the notion of self-interest is a coherent locus of interpretation in the early seventeenth century.